Spelt pancakes are a delicious alternative to the usual offerings when it comes to the pancake department. This lovely grain is thought to be much healthier for you than white flour as it contains a whole lot of nutrients to help keep you feeling your best. 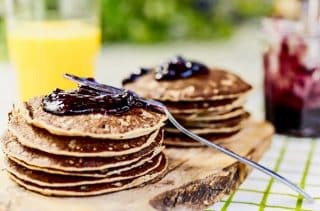 The result of these tasty spelt pancakes is a slightly more nutty finish – somewhere between the flavours of buckwheat and wholemeal pancakes. Their rich background notes mean these pancakes work well for both savoury and sweet toppings – or both if you want to make a whole meal out of them. You could top them with a tasty mix of ham and cheese at tea time and then serve them up with fruit and cream for dessert, we don’t imagine there’ll be any complaints if you do! To begin making your pancake recipe break the eggs into the flour and salt and gently whisk. Gradually blend in the milk, splash at a time, until the batter is smooth like single cream. Melt the butter in a non-stick frying pan, whisk 2tbsp into the mixture and reserve the rest for greasing the pan between pancakes. Leave the mixture to rest for 30mins. Grease the pan and heat until ‘smoking hot’. Add 2 tbsp of the batter to the pan, tipping the mixture from side to side, and using a pallet knife, carefully lift the edges of the pancake. When golden brown, flip the pancake over and cook the other side. Keep warm in the oven with interleaves of greaseproof paper between pancakes. Serve immediately with a topping of your choice!